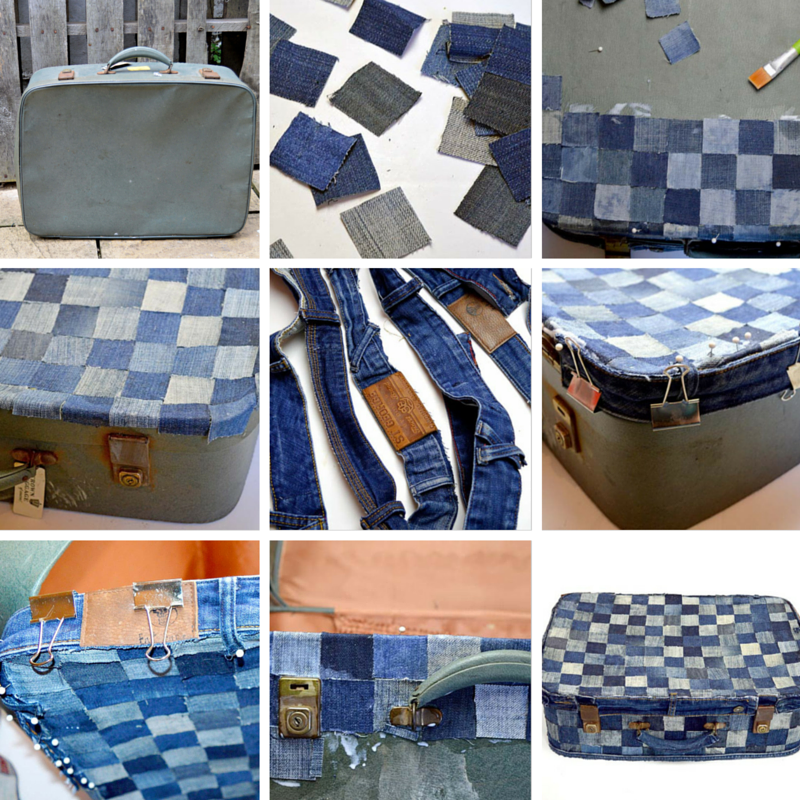 How To Upcycle A Vintage Suitcase With Old Jeans. 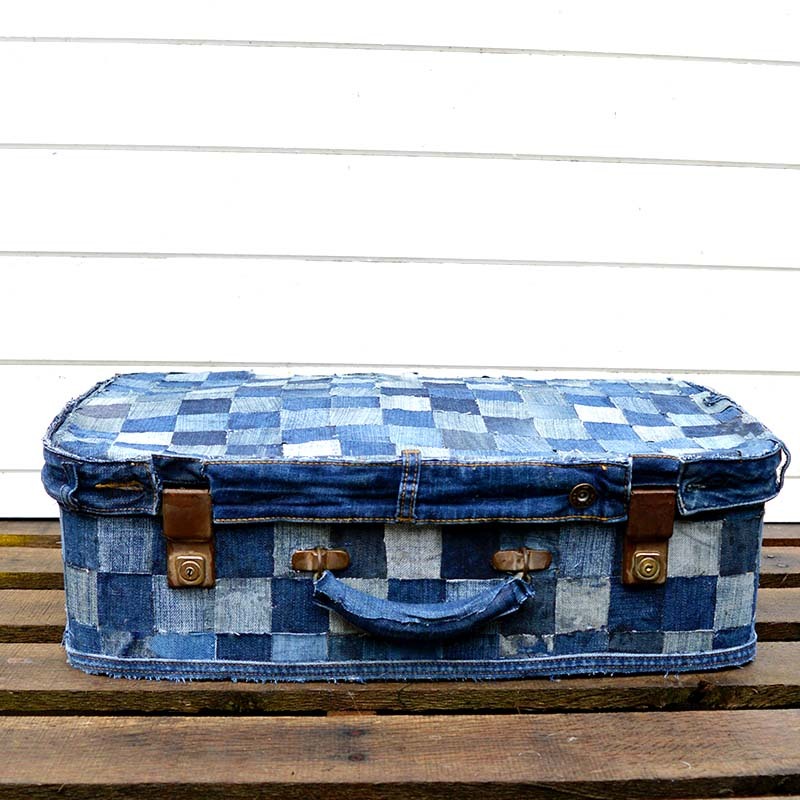 When I saw a beaten up suitcase that was destined for the bin I decided to rescue it with one of my denim upcycles. 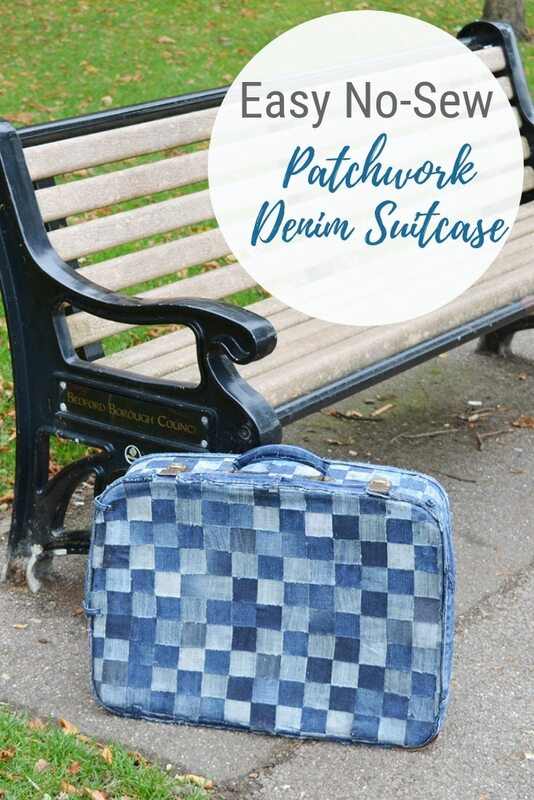 It was so easy and fun to make this patchwork denim suitcase, without a needle and thread in sight. 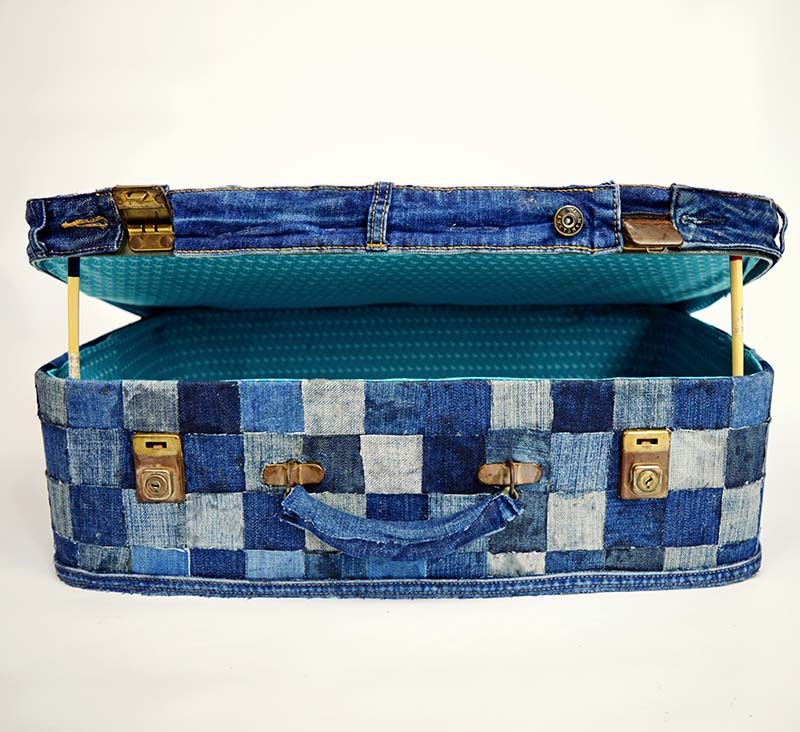 Instead of making another denim bag I decided that a denim suitcase would be a bit different and fun. 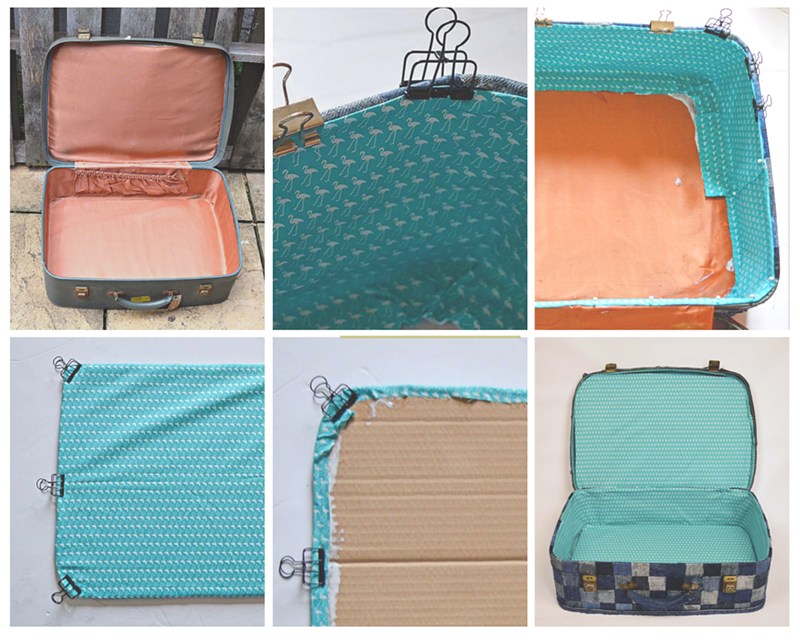 I love upcycling old suitcases and using them for storage. I don’t have my own studio yet, but I’m working on it. Upcycled suitcases are great for hiding away my crafty stuff. 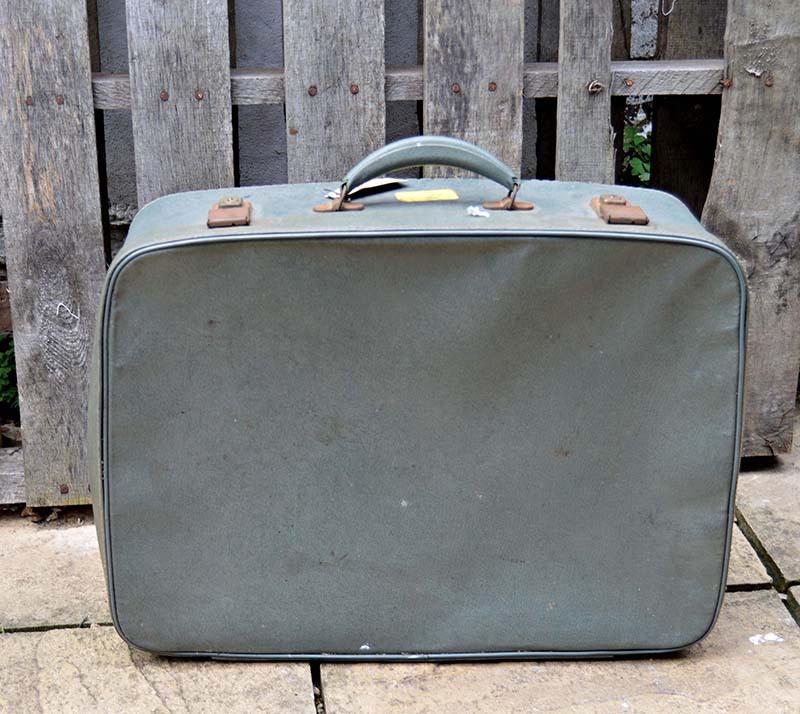 Old suitcase: The suitcase I used for this project was one that had definitely seen better days, so I got for practically nothing from my local junk shop. As you are going to be covering and lining your suitcase you can afford to get a knackered one. The most important thing is to make sure that that the hinges work and you can open and close it easily. Old Jeans – I cut the denim into squares 4cm by 4cm, therefore if you have lots of scraps of denim from previous projects these would be perfect for this. I also used the waistband from 2 pairs of jeans and the seams from one. To achieve a good patchwork effect you need a variety of denim in different shades. Fabric or paper for lining your case; I chose a fabric, and used almost a meter for a medium sized case. As with my vintage map suitcase, I upcycled the outside of the suitcase before lining it. Firstly I cut my old jeans and denim scraps into squares 4cm by 4cm. I did this as I went along, making more squares as when I needed them. I stuck the squares one by one in a random checkerboard effect on the top of the suitcase. 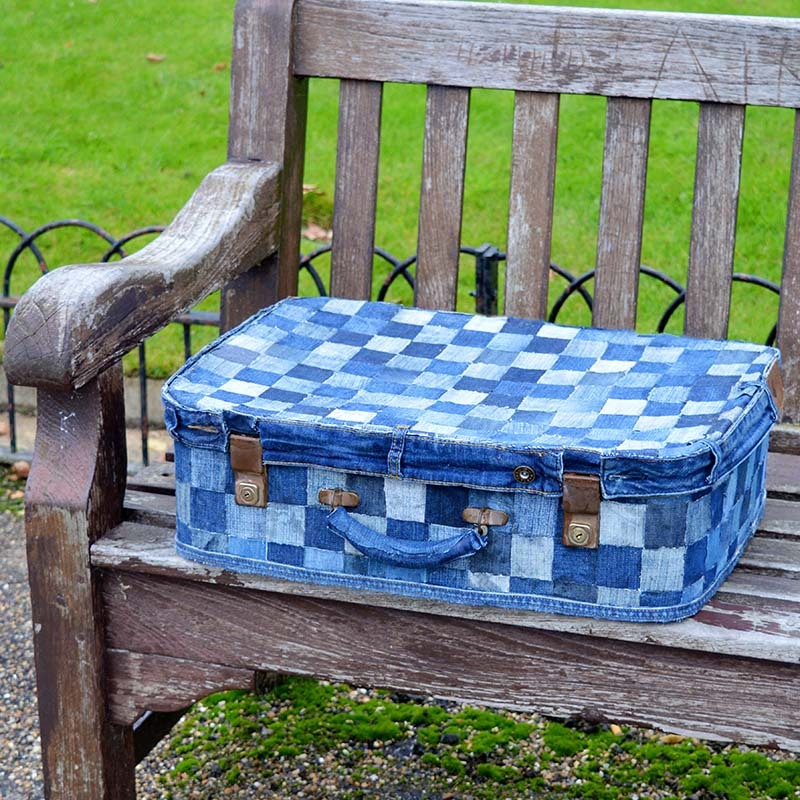 Glue was applied to both the suitcase and the denim squares as I went along. I also made sure that each square was touching. The sides of the suitcase lid were exactly the width of a jeans waistband. So instead of squares, I glued the waistband on the sides. One waistband wasn’t enough to go round the suitcase so I used 2 pieces of a waistband. To hold the waistband in place whilst the glue was drying, I used a combination of bulldog clips and pins. This process was repeated with the bottom, sides, and underneath the suitcase; using bulldog clips and pins where necessary. To add extra interest, as with the waistband on the lid, I stuck a denim seam around the bottom edge of the suitcase. Finally as my suitcase came with an ugly plastic handle, I covered it with strips of denim. If it had been a pretty leather handle, I would have just left it. Measure the inner sides of your suitcase and accounting for a 1cm seam allowance, cut your fabric. The diameter of your suitcase will be bigger than the width of your fabric so you will have to cut 2 pieces. Fold the top edge of about 1cm over on each piece of fabric and glue this down. Cover the sides of the suitcase with glue and stick down your pieces of fabric. The fabric will overlap to the shorter sides and the floor of the case; this is fine just make sure you also glue these bits down. You may find that it helps to pin the fabric while the glue dries. You’ll need to make a top and bottom panel for the case. Measure and cut 2 pieces of cardboard that will slot into the base and top of the suitcase. Using your cardboard pieces as a template cut a fabric piece for each, again allowing for a 1cm seam. Wrap the fabric around the cardboard and glue down the seam edges to the underside. You may find it easier if you miter the corners. 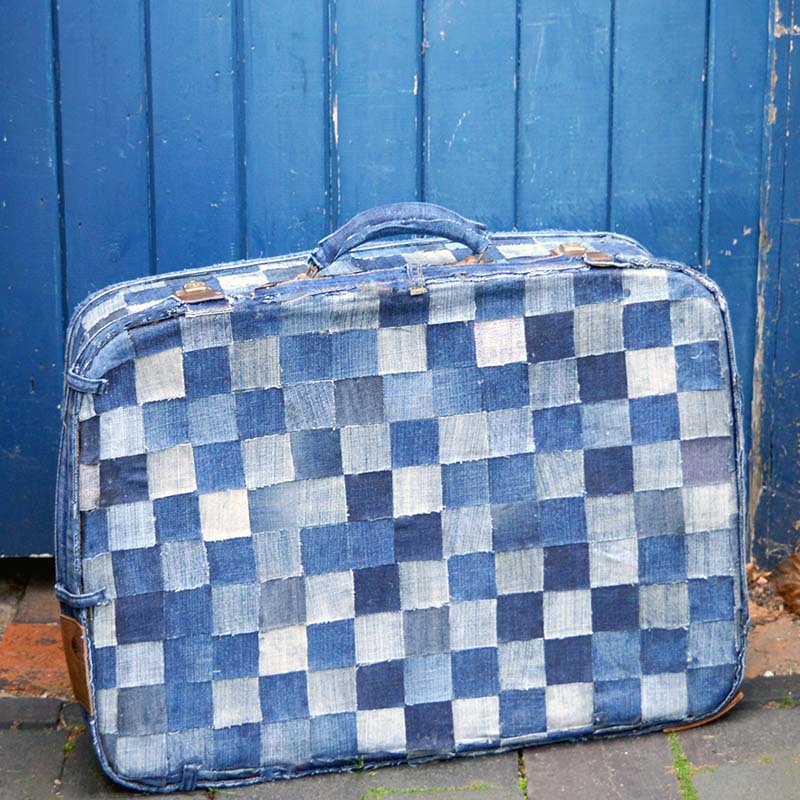 This denim suitcase is now used to store some of my fabric stashes and sits alongside my other suitcases hiding my craft supplies. You could, of course, uses it as a weekend bag. I’m always on the lookout for vintage suitcases to revamp & I fancy making a cocktail cabinet out of the next suitable one I find. 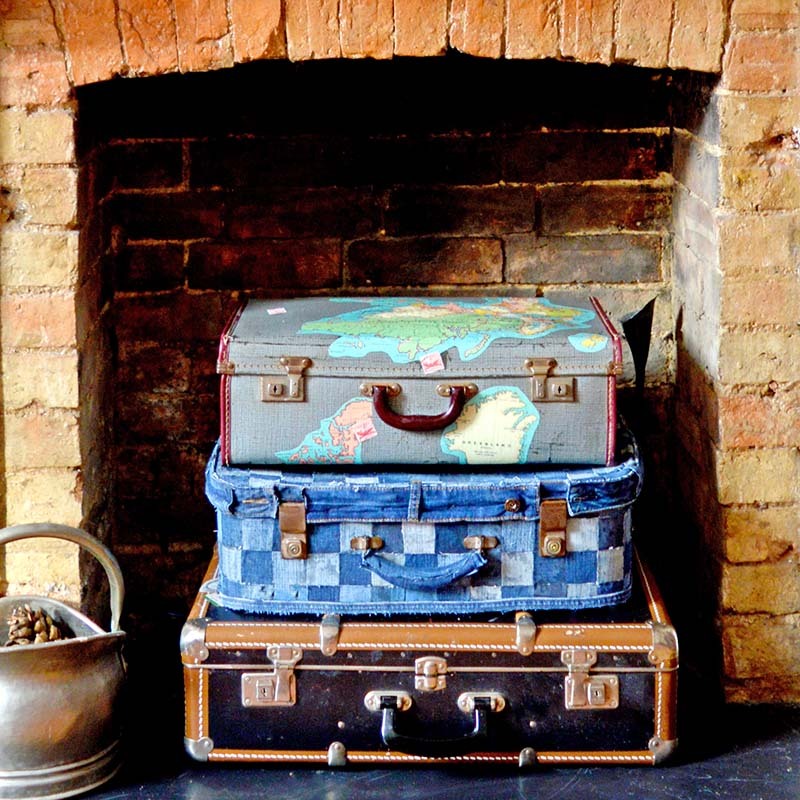 What would you do with a vintage suitcase? If you like to upcycle old jeans then check out all my other denim projects. I have lots of denim and no ideas on what to do with it. I love creative people who can give me ideas and I run with the idea and give it my own bit of personal flare. Thanks for sharing your ideas with others like me. Thank you, you are welcome. I too love to share my ideas. I love recycling jeans. This is such a great idea. I started with your sunglass case and am loving all of what you have done!! The suitcase is great and I keep returning to your chair. Have a really cute little baby bib done with recycle jeans and well. I seriously thinking of trying the suitcase. Perfect. Thanks for sharing your great talent and for recycling!!! Thank you so much Rosemary. The denim baby bib sounds fun. did you cut and glue around the clasps, or take them off and put a square underneath (which is what it looks like, but seems like it would be super hard to get the clasps off. I cut and glued round the clasps, they weren’t easy to remove so didn’t want to risk it. You are so talented and you have alot of patience. I seen a blanket made out of jeans, can you tell me where I can find it? I have alot of jeans that are taking up space. THank you ! I haven’t done a denim quilt tutorial yet, but I’m sure you can find one on Pinterest or if you search on hometalk I know there was a denim picnic blanket recently featured. Wow! Another great suitcase upcycle project Claire. Love this! It looks great with your map suitcase. Thanks so much for sharing it at Vintage Charm. Thank you ! And thanks for hosting a great link up party. Claire, this looks amazing! I have pinned and tweeted it but I am sharing on Stumbleupon, too. This is so creative. I love crafts made from denim. Thank you so much for your kind words and for sharing. 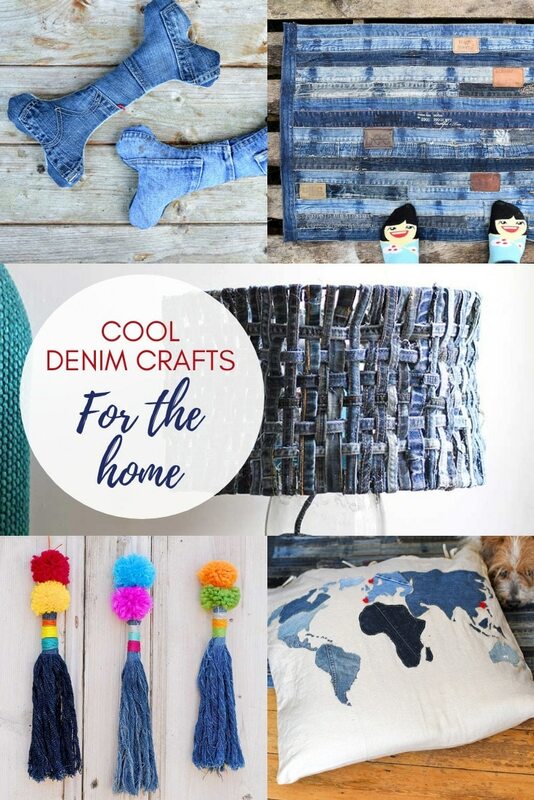 I love upcycling old jeans and am always looking for new denim craft ideas. Thank you for sharing with us at Pinbellish! You are featured this week! Great ! Thanks for the feature. What a cute project! Thanks for sharing on My Flagstaff Home! Thanks ! I did think about cutting the squares bigger but decided I preferred the look of the smaller squares. Also using smaller squares ment I could use more denim scraps. It didn’t take too long and I really enjoy the act of crafting and not just the end result so didn’t mind spending a little extra time to get the look I wanted. Awesome suitcase makeover!! I have a suitcase that my daughter’s have been using to store toys but it needs a makeover…pinned your suitcase as inspiration for such an occasion!! 🙂 Great job!! Thanks ! I love using old suitcases for storage as they look good when on show. I think they would be great for toy storage. I am so doing this! love the patchwork look and of course I love upcycling jeans!! awesome tute appreciate your sharing! Thank you ! 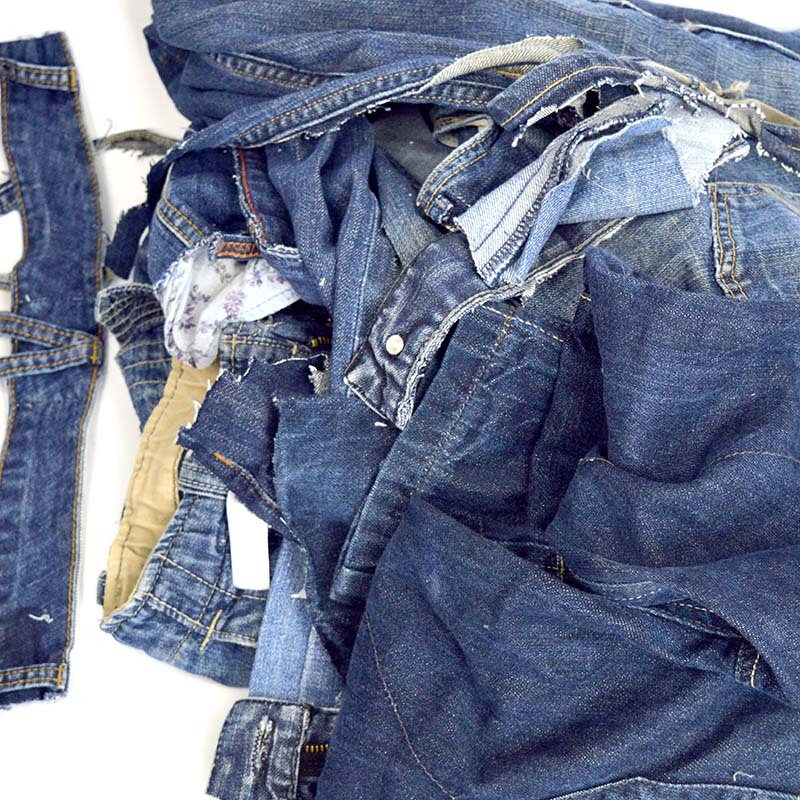 I’m always looking for jeans upcycle projects with three teenage boys I have a plentiful supply of old jeans. Truly fantastic, Claire! Thanks so much for sharing on craft schooling Sunday! I am wondering whether a coat of glue on top of the whole thing would make it more durable? Thanks ! I did think about layer of glue on the top but I think it would ruin the finish. 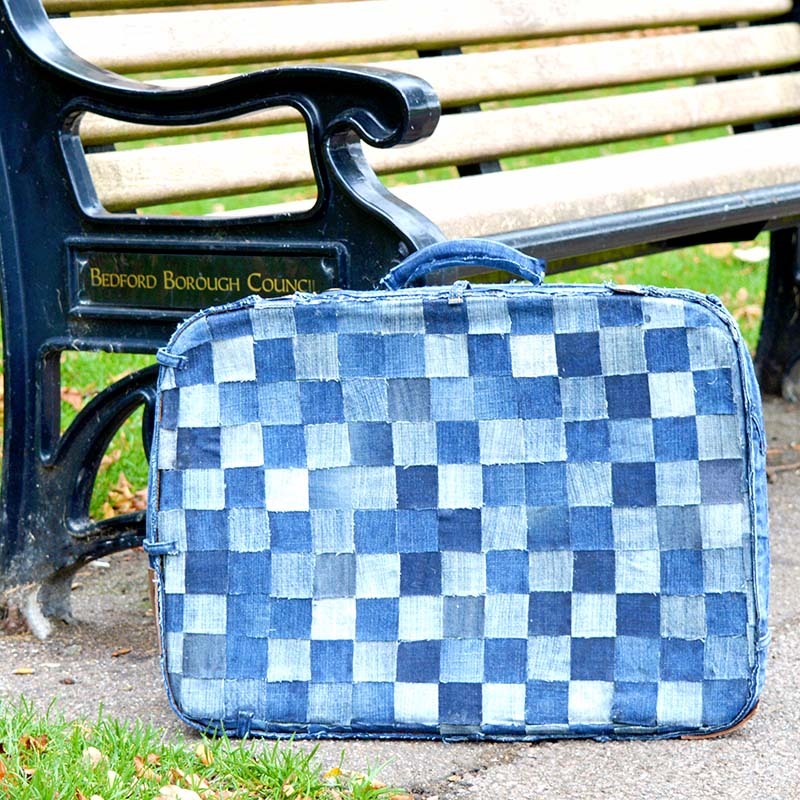 Denim is a pretty durable fabric so I think the suitcase would be fine as long as you don’t leave it out in the rain which I’m not planning on doing. What fun! It really looks woven. Love the waistband touch. Great upcycle! Thanks, I do love the patchwork look. This is a fantastic idea! You are so talented!! I love your suitcase!! What patience that took. I’ve been seeing since I was 6 and what you did with this suitcase was amazing!! Thanks for your kind words, I love it when people like my creations.